RUKUM, Feb 8: Clutching her one-year-old daughter, Dhan Kumari Sunar of Putha Uttarganga Rural Municipality-12 in Rukum (East) has been away from her home for the past one week. Joining hundreds of protesters, she has been hitting the streets demanding that the district headquarters be fixed at the place decided by the previous government. Similarly, Anari Budha of the same village, too, has been staging protests demanding that her village be made the headquarters of the district. According to them, a place accessible to all in the district should be declared the headquarters. The debate over the headquarters of Rukum (East), the only mountain district of Province 5, is getting serious day by day. Various committees and locals have been staging protests in Golkhada, which was declared the headquarters by the cabinet during the tenure of the then Prime Minister Sher Bahadur Deuba. Some people have been staging rallies and sit-ins while others are boycotting the government works as a part of the protest. Since Rukum was divided into two districts, people of East Rukum have been reaching Rukumkot of Sisne Rural Municipality for receiving government services. The cabinet meeting of January 25, 2018 had declared Golkhada as the permanent headquarters. Following which, locals of Rukumkot had filed a writ petition at the Supreme Court (SC) expressing their dissatisfaction over the decision. Later, SC ordered the government not to implement the decision. As the decision is heading nowhere, locals of Golkhada and Rukumkot have been staging protests demanding that their place be made the district headquarters. Shunning all their works, even the representatives and government officials of Golkhada have been staging protests these days. By shutting down the ward and rural municipality offices, the elected representatives have been participating in the agitation. Ram Chandra Pun, chief of Bhume Rural Municipality-1 stated that the representatives have been struggling for the rights of people. 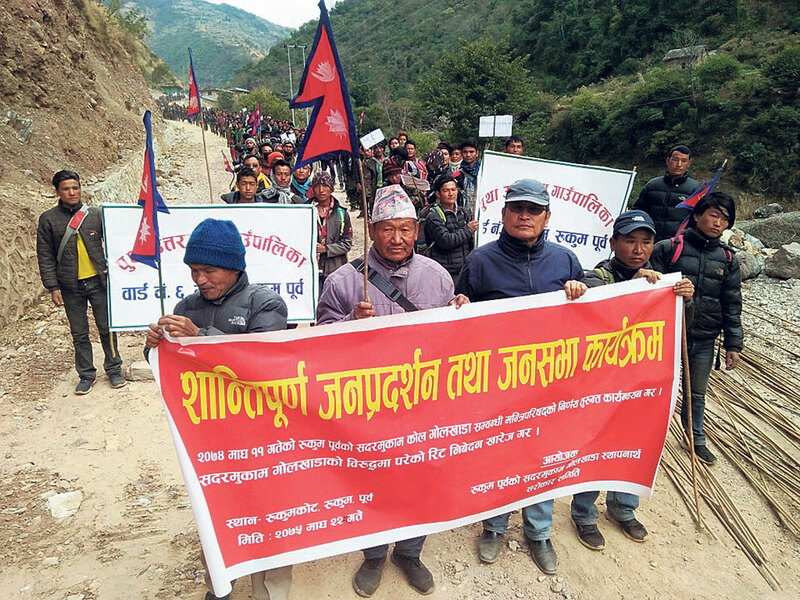 Similarly, Lahari Budha, ward member of Bhume-11 informed Republica that locals of all wards are actively joining protests to make Golkhada the headquarters of East Rukum. "It is not the decision of the party but of the people which matters the most," said ward member Budha. Meanwhile, Nepal Communist Party (NCP) has issued a press release directing its cadres to stop the protests. However, neither the members of NCP nor the locals are ready to quit the protest. Protesters have demanded all the government workers in Rukumkot to obey the decision of the cabinet and return to Golkhada. Caption: Locals of Golkhada participating in a protest.